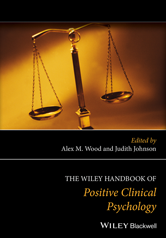 Edited by the founder of the field, this is the first handbook on positive clinical psychology -- a revolutionary approach that places equal importance on both the positive and negative aspects of mental health and well-being. Why Do We Need a Positive Clinical Psychology? Are Self-Efficacy Beliefs Causes of Behavior? Where do Self-Efficacy Beliefs come From? Why is Self-Efficacy Important to Positive Clinical Psychology? Does Ambivalence Account (Partially) for the Psychological Health Benefits of Nostalgia? Can Positive Interventions Bolster Well-being and Reduce Depression? Is the Hypomanic Endophenotype Reliably Associated with Bipolar Disorder? What Makes Hypomanic Experiences a Problem? Why does Resilience in Childhood and Adolescence Matter? Can Happiness be Lastingly Changed? How can Happiness be Increased? Why Use Positive Activity Interventions to Alleviate Depression? Are Psychotherapy-Induced Modifications in Well-being Enduring?